Dont forget to remember 23rd march. On 23rd , March, 1931 in the morng time legendar BHAGATH SINGH, RAJGURU,SUKHDEV Were hanged to death for our nation. Use face books/ othersites to make it a day to remember.....each and every Indian should , at every moment of freedom should think of them and every freedom fighter....every minute. Shivram Hari Rajguru -Another word that ends the serach for meaning of determination...a revoloutionist , a maratha ,who was part and companion of shaheed bhagat sing for the murder of british police officer j p Saunders, in 1928, against the violation of human rights against our citizens. Not a foot back not..Sukhdev Thapar...Another Revoloutinary........from Ludhiana..
23.03.2013, will complete 82 years.........from the day of their hanging/shaheed hona..
yES THATS THE NEED OF THE HOUR. भारत के सच्चे शेरों को देश कभी भुला नहीं पायेगा. 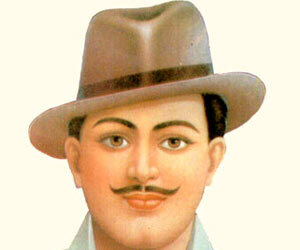 My Salute to Shaheed Bhagat Singh,Sukhdev,Rajguru and Thousand's of People who fought against British Empire.